How do I share my newsletter on my website? 1. 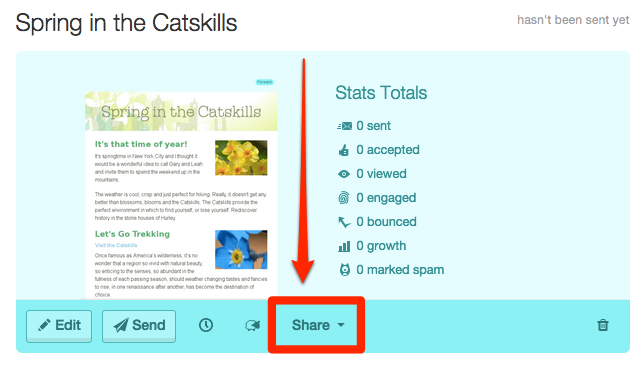 Click the Share Button under the promotion that you want to share. 2. Copy the URL from the pop-up that appears. 3. Paste the URL wherever you need it. 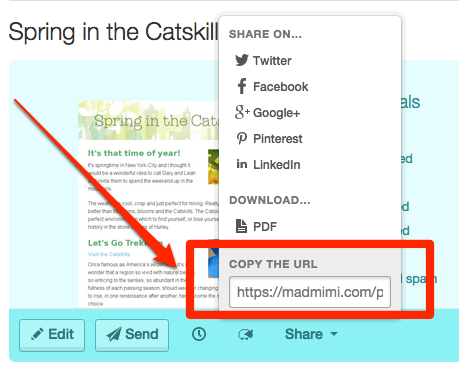 You can share your newsletter URL on your website or blog, in a tweet, inside another promotion… pretty much anywhere you want to share your newsletter or promotion. :-) Whenever someone clicks that url, they’ll be taken to your newsletter’s Web View. You might get fancy and use an image instead of text for people to click. Use this technique to send new audience members a welcome email promotion with a list of past newsletters — well, not all of them but a few of your best would be nice. Email your newsletter editor the URL so they can look at the promotion in progress without logging into Mad Mimi. And if you change the promotion? You guessed it. All they have to do is refresh their browser window after you’ve “Saved” changes. Mimi Magic!